It’s plagued with a lot of early problems, but it’s a great idea. Nexus Blitz, Riot’s brand new experimental League of Legends game mode, arrived on the PBE this week, giving us a chance to try it out. The bad news is that it’s extremely, extremely clunky right now. Although Riot did say this was more of an alpha test than a beta test we expected the map, at least, to be put together. It is definitely not put together—at least not very well. Not only that, but some things are fundamentally broken, like when it kicked us out of the game, alongside every other player, whenever the game hit around eight minutes. 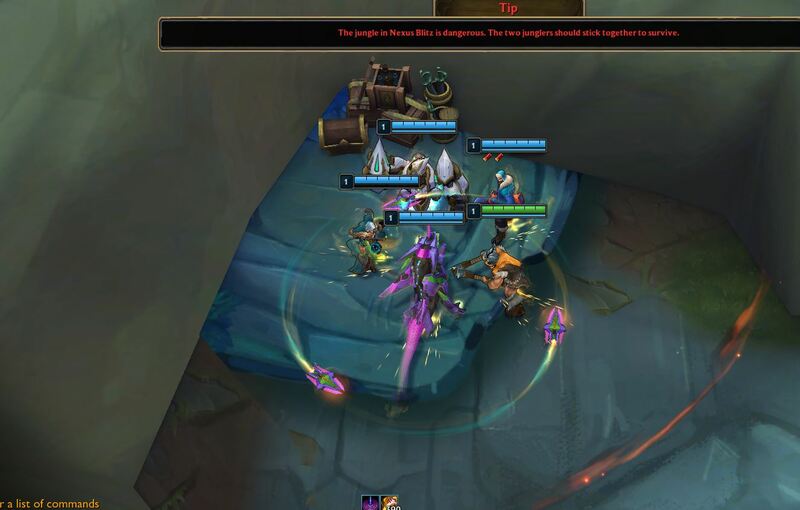 This happened each and every time we tried to play, which was four times, and although that seems like a very short amount of time to play a game, that’s all the time you need in order to really capture the essence of Nexus Blitz. The map is definitely the biggest issue. That giant hulking clunk of greyish-green behind the spawn is actually the wall of the map, and we assume (and hope) that it’s merely unfinished as of yet. If it’s unfinished, that would mean a real wall or external map would potentially be loaded up before this hits the live client. The stone surrounding the Nexus on the ground, which you can see just past the spawn in the image above, seems blown out to the point that it’s colliding with the regular dirt and grass pixels. The ground on the rest of the map seems to be fine, and is in fact heavily-detailed, which makes the area around the Nexus stand out even more. Both of those issues seem to just be simple “unfinished map” issues, and that means they’ll probably be patched up soon. There are some other parts of the map that feel pretty awkward that do appear to be finished, however. For starters, everything seems really small. The bush in the above image with Olaf is smaller than him in height, as well as almost in width, and we’d actually consider that one of the largest bushes on the map. Most of them are little tiny things that barely take up your champion’s hitbox. Other features of the map are very small, too, including the walls and trees. On Summoner’s Rift, the walls and trees are grand and really make you feel like you couldn’t pass through them. 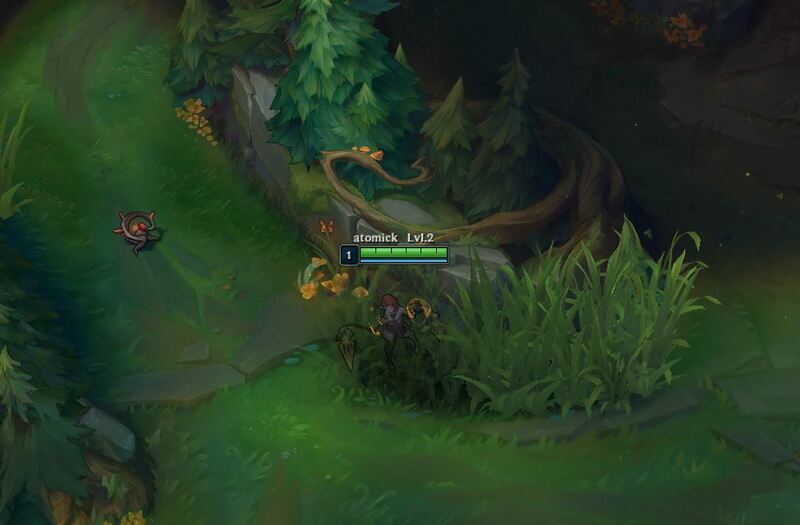 On Nexus Blitz’s map, the trees and obstacles are so small that there are frequently spaces that can deceive you into thinking you can move around them. Not only that, but you’re never quite sure when you’re hiding in brush, because the brush is so small, too. 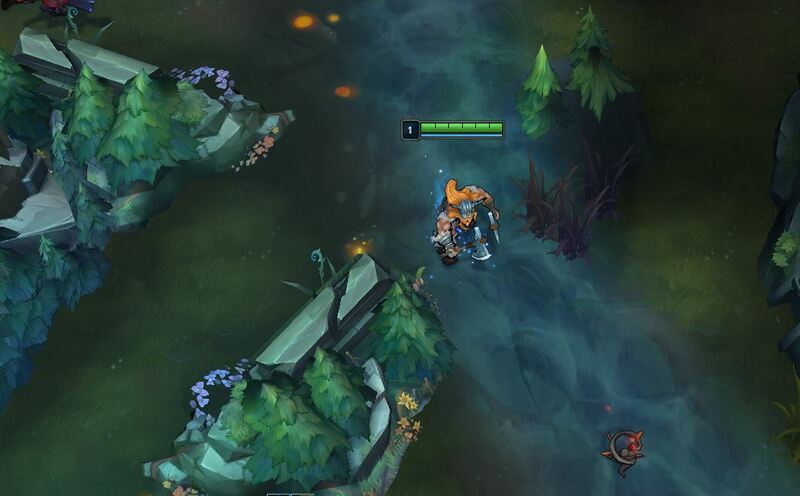 Here’s an image of Summoner’s Rift for comparison. Some of the other aspects of the map feel very out of place, too. 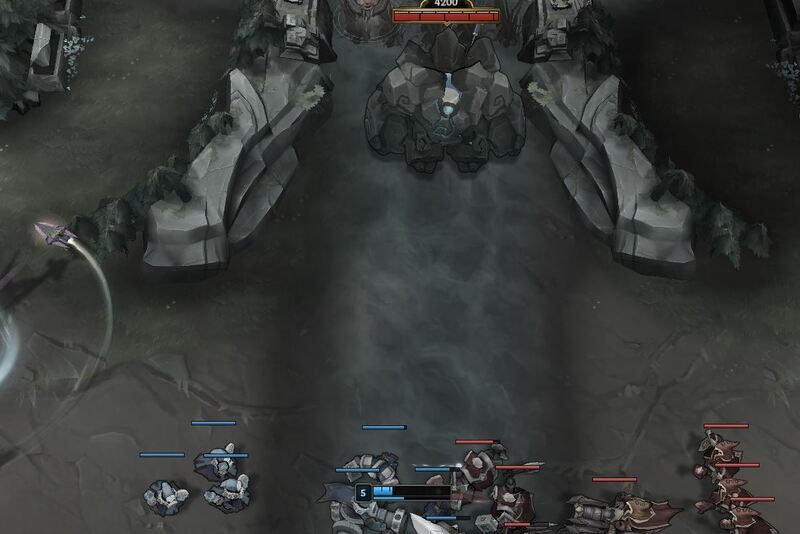 For instance, the blue buff is right in the middle of the map’s lane, shown below. This game mode is supposed to feel very hectic and the special in-game events are supposed to be very tantalizing and inviting in order to coax you into a bloodbath with the enemy team. The blue buff being literally attached to the main lane feels very strange and distracting. What’s even stranger is the red buff being at the very northern tip of the map, furthest away from any of the action. Why would the blue buff be so close to the combat, to the point that it’s a problem, while the red buff (a more combat-centric buff) is tucked so far away that you forget about it? It doesn’t make much sense, and hopefully Riot decides on a new placement before it goes live. The new map is very disorienting, to say the least. It feels less like a battleground full of mayhem and more like we stumbled into some strange dream where we’re all giants and the landscape suddenly shrunk down to our height. Once we got past the gag reflex caused by the map, we were finally able to enjoy what the game was really about—events. A loud boom sounds through the arena, and a 30-second countdown starts at the top of the map. It warns you that an event is about to start. 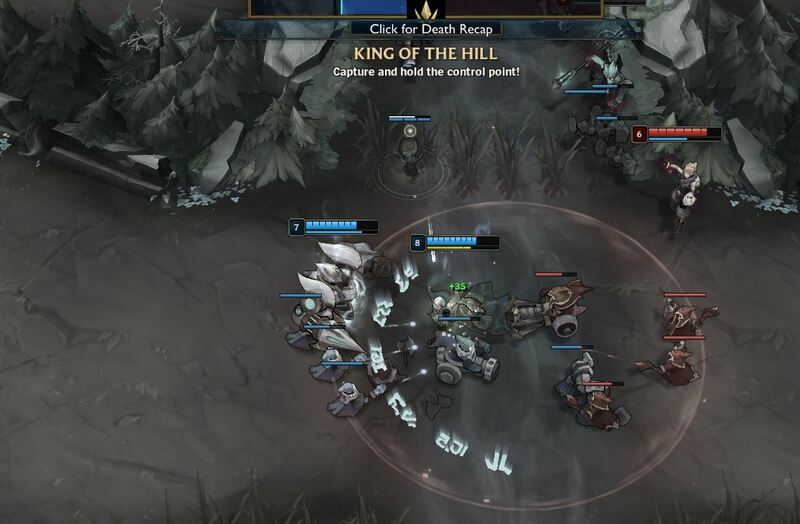 If you want to win Nexus Blitz, you need to win more events than the enemy team, because winning events gives you massive, dramatic buffs (like Blitzcrank hooks on siege minions). You don’t know where the event is going to take place, and it doesn’t even appear to warn you on the map once it does spawn. After another loud noise, the event begins, and the rules of the event appear at the top to let you know what you’re about to rush into. Out of the four times we played, we got a payload event once and King of the Hill three times. These events are what makes this mode so fun, even through all the weird map issues and poorly-defined rules. When that sound goes off, both teams know what’s on the line, and they rush to meet each other in sudden, five-on-five combat, even if they aren’t ready. It doesn’t matter if you’re half-health from killing a jungle camp, you’re out of mana, or you have enough gold to recall and pick up a big item. When that fight starts, you better be there, or the enemy team is going to take it. It’s pure, unfiltered chaos, even more-so than any ARAM or URF match we’ve ever played, and it was beautiful fun. Once the kinks are worked out, Riot might have a real winner with this one. Of course, it was right after the first event that we were kicked out of the game each time, but hey, it was fun while it lasted.